When Do Those Three Months Actually Start? I recently applied for the Chase Ink Bold charge card, which comes with 60,000 bonus points if I spend $5,000 during the first three months from account opening. This was a no-brainer application for me, given the fact that no one else is offering such a handsome sign-up bonus with such a small annual fee. Oh, and the annual fee is waived for the first year, making the deal even sweeter. However, $5,000 is a big minimum spending requirement for a three-month period, and I’m sure not everyone out there is willing or able to spend that kind of money in such a short period. That being said, I wanted to be 100% clear on when the three months started and ended so there wasn’t any confusion, or worse, a just-missed bonus. After all, it’d be pretty lame if I spent $4,900 during the first three months, missing the 60,000 points by just $100 or so. To get to the bottom of this, I decided to message (not call) Chase to get the answer. I chose to message them because I wanted the answer in writing, as opposed to a mumbled, undocumented response via the phone that may or may not be correct. “In reference to earning 60,000 bonus points after spending $5,000 during the first 3 months from account opening, can you give me the specific timing for this. Further, your account was opened on 04/22/2014. Hence, in order to qualify for the bonus reward points you had to make purchases in the amount of $5,000.00 on or before 07/21/2014. Okay, so it really is three months, not 90 days (though it’s very close). It’s actually 91 days for these particular months. I suppose it can vary based on how long and short the months in question are. But what’s more interesting is when the clock starts ticking. It’s when you get approved for the card, a date that may not be very obvious unless you do some digging. 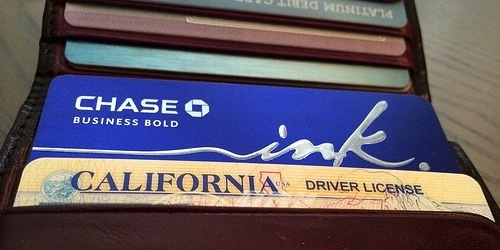 As it turns out, I didn’t actually receive my Ink Bold until April 29th, which was the date of my first transaction. So I essentially lost about a week from those three months. Now this might not be a huge deal for big spenders, but for those who are cutting it close in the minimum spend department, that week could matter. And these cardholders may be led to believe they have more time to meet the minimum spend than they really do. So if you’re going after one of these sign-up bonuses, make sure you are utterly clear on when you need to spend the money. Don’t just assume it’s three months or 90 days from when you received your card. As you can see from my example, it will likely be shorter. If you want to reduce the time lag, you can ask Chase to expedite the shipping of your card, though there’s no guarantee they will abide by your request. Tip: Some credit card issuers offer a so-called grace period to complete the spending. For example, Citi gives you an extra two weeks to account for the mailing of your new card. And Bank of America only starts the clock when you actually activate your new card.